Hemispheres has used video to document thousands of focus groups, in-depth interviews, ethnographic interviews, and shop-alongs. 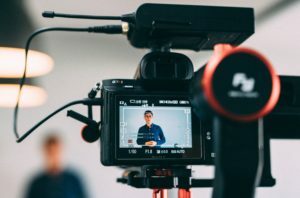 Our colleague Paula Rosecky recently wrote an article about how to create the most compelling video. Please take a look at it below. Her article was originally published in the Fall 2018 issue of QRCA Views. We have the opportunity and obligation to humanize data, especially in this time of Big Data. What better way to represent people than to allow them to represent themselves? The combination of their words and their visuals make the insights we uncover indisputable and undeniable. The insights become amplified and more memorable. The quality of your video is only as good as the quality of your audio. You can always add in visuals to express a thought, but you can’t recreate a thought without adequately capturing the quote. When making decisions on equipment, make sure you are using the highest quality audio equipment within your budget. Sennheiser and Rode are often recommended by videographers. If taking video is central to your business, consider the Sennheiser G3 lapel wireless mic. If you only invest in one thing, invest in great audio equipment. Outside of using your smartphone which is perfectly adequate for some DIY projects, cameras that do a good job are the Canon HF R800 and the Panasonic G7. I also can’t say enough about using a small tripod like JOBY with a ball head. This portable piece of gear maintains the stability of the shot and avoids camera shake. Because it is small, it is also easy to move around, giving you flexibility to change position with it. There are a few things you can do to make the production process go more smoothly. Let the participant complete a thought for more compelling video. The long-standing adage of “do more listening, less talking” comes in handy when conducting a videotaped interview. When we interrupt someone mid-sentence, it not only changes someone’s course of thinking, it also makes it more difficult and time-consuming to edit the thought when creating video. Tap into your inner videographer and scout the space. Videographers focus on the lighting and background; it consumes them. If available, look for a spot that has good natural lighting. Make sure the lighting illuminates the participant’s face rather than the back or one side, so viewers can see the main subject’s face. After all, a large part of bringing someone to life is fostering an environment for authenticity. Make sure their expressions and motions shine through. It can also help set the scene to have a bit of personal or relevant background in the shot. If you’re talking about kitchen appliances, set the shot in the kitchen or in the dining room with the kitchen in the background. If you’re talking to teens, think about having their favorite sports gear or study materials next to them. If you’re talking about pets, make sure to include Charlie in the shot! Staging can really help bring out that person’s character. Create a basic story board or outline with each of the topics and shots needed. Do a few practice interviews to learn how to set up your gear and improve your interview skills. Scout the interview location ahead of time if time and budget allow. Bring snacks and beverages to the set if you’re spending a significant amount of time there. Test and check footage and audio levels! Giving people a range of time in which to deliver their answer is also helpful. I’ve found less than a minute to be sufficient for many answers. Have you ever videotaped yourself talking for one minute? You can say a lot in that short amount of time. The goal here is concise, editable answers. With any luck, you’ll capture a few people who nail it and reduce your editing time. If you give people too much time, you may not get a concise enough answer. Videotaping shop-alongs can be tricky. Having store approval is key. Since we’re often moving up and down the aisles with less control of the shot, I concentrate on the quality of the audio and not as much on the lighting. Again, think ahead and set yourself up for making the editing process smoother. If it aligns with objectives, make sure to stop along the way to review the person’s thoughts and steps. Conducting an exit interview is another great way to get clear editable, content at the end of the interview. In the end, a great video is all about the insights – and a great edit. The work you do to prepare for editing is just as important, and more time-consuming, as the editing itself. One guiding principle is that you’ll need about one hour of editing time for every one minute of finished video. Always get timecoded transcripts. It makes it easier to find the exact quotes you need. There are some great tools out there to help you make editing seamless and even fun. The two main editing software systems recommended by videographers for DIY video producers are Adobe Premiere Pro (Windows and Apple) and iMovie (Apple). They are extremely useful to help you organize your video and provide a lot of great online training tools. Other great online resources include low cost videography classes such as those offered on creativelive.com. Even in a DIY video project, you can add more richness by including background music. Music without lyrics is less distracting and often works best to create an ambiance. Be careful about audio copyrights. They protect the creative work of the owner. Free, legal music sources with creative commons licenses can be found at Free Music Archive or NoiseTrade. Some projects may require more polished, produced video. When using a professional videographer make sure to allow more time in your timeline. You’ll want to brief them on your research and video deliverable objectives. You will want to share the following with them: Who is the audience, what do you need to communicate to the audience, what impact you want to make on the audience, what is your anticipated timeline and budget. When choosing a videographer, find out how long they’ve been in the business, so you get an idea of how much experience they have. Ask: What is their production style? You’ll want this to match your vision of the final edit. Most videographers will have a perspective on this. Seeing examples of their work will help you decide if their style matches your vision. You may need to allow for scouting time and costs – these are associated with prep and setup before you start filming. In my experience it takes two to two-and-a-half days to receive the initial edit for review. You may need to go back and forth a few times with your videographer or editor to create the final edit, especially if you need client input. More and more our clients expect us to create compelling video of their customers’ authentic stories. Video deliverables are an impactful way to touch the heart and open the mind. Our job is to select the voices of those who best represent the insights we want to communicate. Why not let those customers do the talking through the power of video? If you’ve been hesitant, now is the time to look through that lens and press the record button. It may take a bit of work, but the result will expand your skill set and elevate your end deliverable. Acknowledgements: Contributions to this article were made by Matt Collins, Hemispheres, and John Tiscornia, photographer and videographer.